Stanley Kubrick’s film adaptation of Stephen King’s novel The Shining is about as creepy as it gets. Hallways flowing with blood, paranormal activity, insanity… what’s not to be afraid of? If the movie didn’t scare you enough, take a look at some of these behind-the-scenes pictures that will make the hair on the back of your neck stand up. 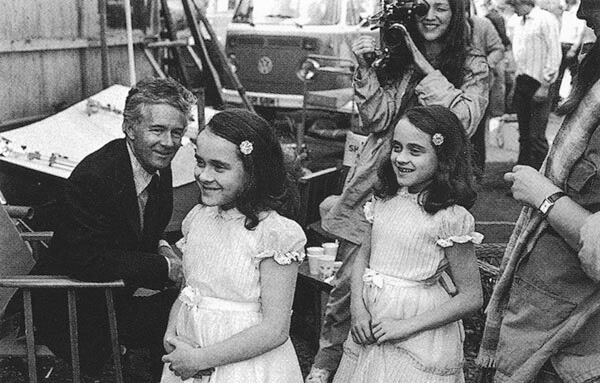 So, apparently, these two twin little girls are equally as scary in real life as they are in the film. This must have been a weight off of Kubrick’s shoulders knowing that the girls simply had to stand in front of the camera in order to be horrifying. Personally, I would have avoided the two both on and off the set, afraid they would curse me or try to attack me. Think of their poor parents that had to live with these two, while most people only see them in their nightmares.